Am I the only one who is confused about what PEMF device to get? No. I speak to many people about choosing a PEMF system once they decided a PEMF system can help them. The first thing I need to know is what they are using it for. Is it for a problem that just began and is likely to be self-limited or is it for a chronic problem? Is there one area involved or are there multiple areas? Next, we consider whether it should be to treat the whole body or mostly for local problems, such as a knee, elbow, shoulder, head and so on. Is there electrical or magnetic field sensitivity? Answers to these questions allows me to narrow down the choices. The next consideration is magnetic field intensity. Next is what frequency or frequencies may be needed? I can only give some examples in this video. 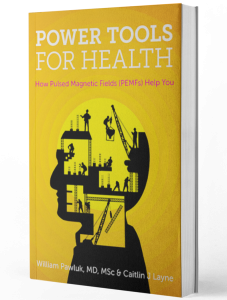 More information is available in the Power Tools for Health book or the DrPawluk.com website. Intensity vs. frequency – Which one matters the most? Most of the time either medium or high intensities are used to resolve specific health issues. Very low intensity PEMF systems, that is, under 10 Gauss, whether whole body or local, are best for health maintenance. They can still help many problems but are just not as effective as quickly. Whole body problems, such as osteopenia or osteoporosis, will require a whole-body system. Whole body systems vary in intensity from under one Gauss to upwards of 1500 Gauss. Whole body PEMF systems under one Gauss can be nearly as expensive as 1000 gauss devices, but they would be considered less likely to be as effective. Superficial problems such as carpal tunnel syndrome, tennis elbow, tendinitis, bursitis muscle strains and sprains, and even fractures of the hands and feet, can be dealt with by medium intensity devices, used 1 to 2 hours a day for one to several weeks. Once a problem feels better, it is not necessarily healed, and treatment may need to be continued for weeks or months. Owning a PEMF system allows flexibility to set one’s own schedule for self-treatment. Frequencies are most important when it comes to considerations of impact on the nervous system, particularly for reducing anxiety or stress, improving pain, helping with sleep, increasing alertness, the need to stimulate stem cells and so on. That means devices that allow control over the selection of frequencies become important for these situations. Selection of frequencies is also important in people with fibromyalgia, chronic fatigue syndrome and any treatments to the head. High intensity PEMF systems become much more important when dealing with problems deep in the body, such as in the spine, abdomen, chest or brain. They are also more helpful in people who have limited time to be able to do their treatments. The rule of thumb is: higher intensity tends to work better and faster, and often less daily treatment time will be needed.